Our Berry Bright Illuminator hair range to help protect and illuminate coloured hair. Enriched with natural ingredients extracts: Moroccan Argan Oil & Cranberry Oil. Helps keep coloured hair soft and shiny wash after wash. Vegan formula: No animal derived ingredients or by products. 100% recyclable bottles. Explore Garnier Ultimate Blends Argan Oil Coloured Hair range, developed to protect and illuminate coloured hair. - The Colour Illuminator: our ultimate care blended for naturally beautiful hair with Moroccan Argan Oil and Cranberry Extracts All things bright are beautiful. Nourishing Moroccan Argan Oil and antioxidant-packed cranberry extract are blended with love in uplifting formulas, crafted to lock in vibrancy and keep coloured hair soft and shiny wash after wash. Never a dull moment. Discover The Colour Illuminator's naturally derived ingredients - Traditionally produced in Morocco, argan oil is rich in omega 6 and vitamin E. Argan Oil is a treasured natural ingredient for its restorative and protective properties. Bursting with goodness and complementing the argan oil, cranberry seed oil extracts contain high concentrations of antioxidants and omegas 3, 6 and 9. 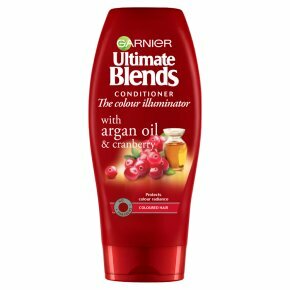 How to Apply Garnier Ultimate Blends Argan Oil Conditioner: Smooth generously into wet hair and rinse thoroughly. Use after our Argan Shampoo for Coloured Hair. For dazzling radiance and intense care, indulge in our Argan Oil Hair Mask.